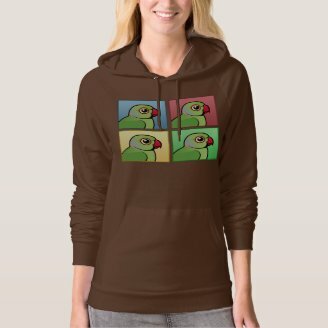 The native range of Monk Parakeets is around subtropical parts of Argentina and surrounding countries in South America. 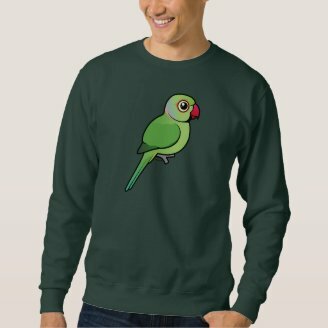 There are many self-sustaining feral populations of Monk Parakeets outside of South America, mainly in Europe and North America. 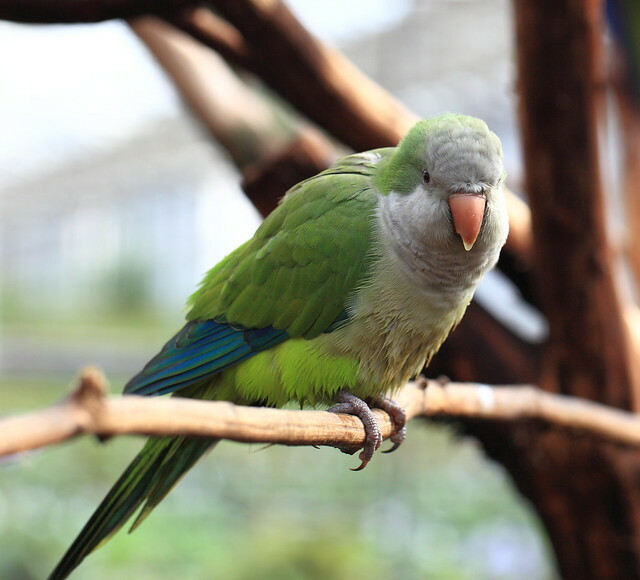 The Monk Parakeet was brought to the United States in the late 1960s as a pet. The first feral Monk Parakeet to be recorded in the U.S. was in New York in 1967. Many birds escaped or were intentionally released, and populations were allowed to proliferate. By the early 1970s, Monk Parakeets were established in seven states, and by 1995 they had spread to eight more. There are now thought to be approximately 100,000 in Florida alone. The Monk Parakeet is the only parrot that builds a stick nest rather than using a hole in a tree. These birds typically build their nest in a tree or on a man-made structure. These huge nests attract many other tenants, including birds of prey such as the Spot-winged Falconet or ducks such as the Yellow-billed Teal. Monk Parakeets often breed colonially and build a single large nest with multiple entrances for each pair. In the wild these colonies can become quite large, with nests that can reach the size of a small car. 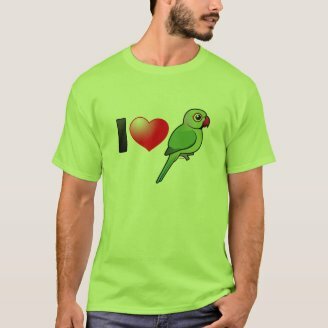 Myiopsitta (monachus) luchsi (aka Cliff Parakeet) -- Has no scalloping on breast, underparts are brighter yellow and lives in the Andean valleys of central Bolivia. 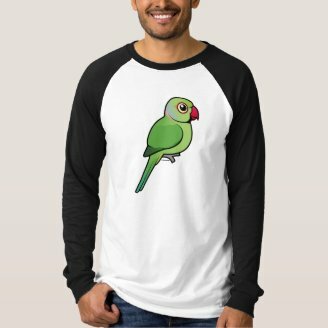 The Cliff Parakeet subspecies may eventually be recognized as its own species again, as it has been on-and-off since it was first described in 1868. 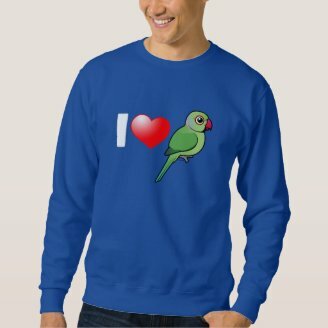 The lifespan of a Monk Parakeet is 15 to 20 years in the wild and 25 to 30 years in captivity. 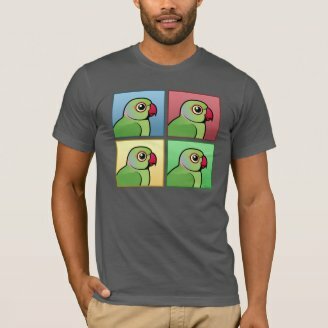 Other names for this bird are: Quaker Parrot, Monk Parrot or Quaker Parakeet. 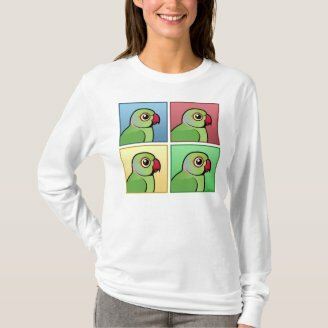 A group of parakeets is collectively called a "chatter" or a "flock" of parakeets. 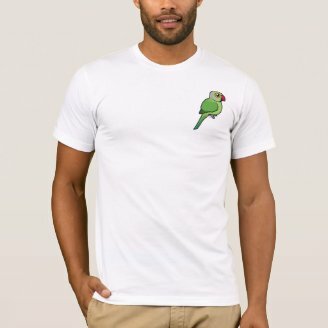 Quaker Parrots are popular pet birds for their comical personalities and energetic nature, but they are also notoriously loud and noisy birds, so take caution before rushing out to get one. They can live to be 30 years old, so caring for one is a long commitment. The birds are also illegal to keep in some U.S. states, especially in the south due to the established feral populations. 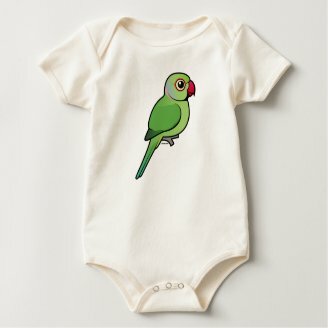 The Monk Parakeet was added to Birdorable in August 2007 and we have hundreds of original customizable gifts with this cute bird. 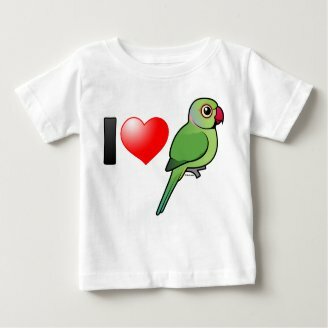 Check out our cute Monk Parakeet gifts or our other Birdorable parrots and parakeets. 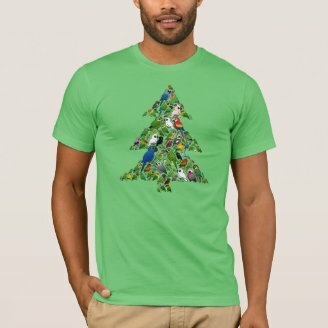 This week's featured t-shirt design is our I Love Budgies with three Birdorable Budgerigars in a row. 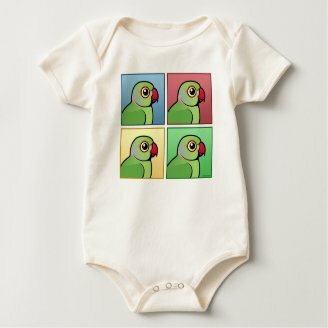 They include the gray budgie, blue budgie and blue-and-yellow budgie. 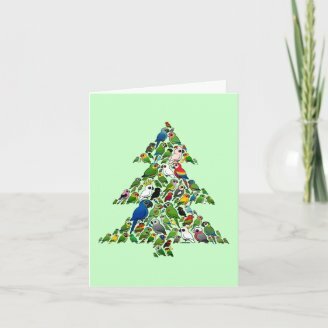 Cute gifts here for budgie lovers! 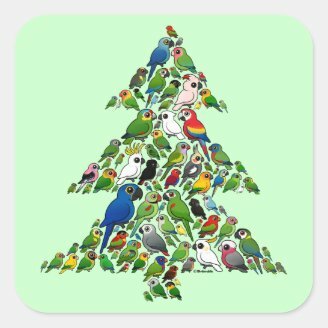 A huge flock of totally cute Birdorable parrots and parakeets perch together to make up a Christmas tree in this original holiday design. 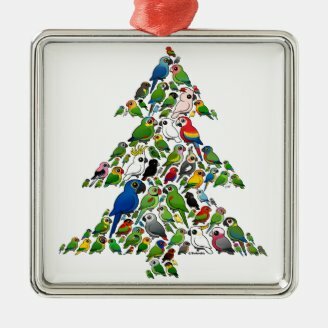 Macaws, Conures, Cockatiels, Budgies, Linnies, Cockatoos and other cute birds make up this festive flock! 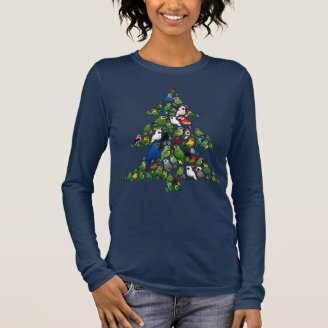 An original design that would make a perfect holiday-themed gift for any parrot lover! It is available on many different products. 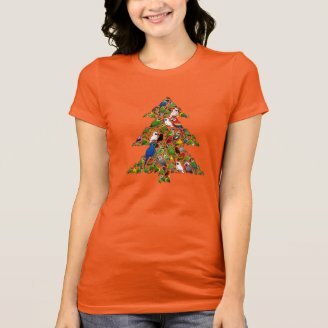 For more original Birdorable Christmas designs visit our Christmas page. 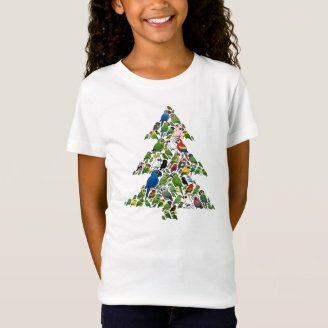 Our totally cute Birdorable Monk Parakeet is ready for Christmas! 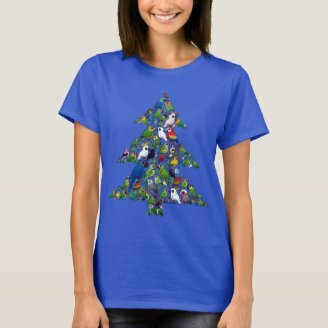 Wearing a cute Santa Hat and perching on a blue glass ball Christmas ornament, the Quaker Parrot / Monk Parakeet in this design for the holidays is too cute! 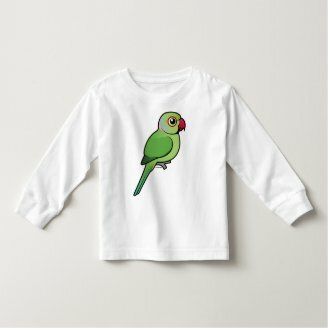 Great for everyone that loves parrots!